For use on 1967 1968 1969 Camaro Firebird. Seals prevent water drainage into rear of body and trunk area. Molded rubber with stamped steel spine as original. RH and LH, pair. 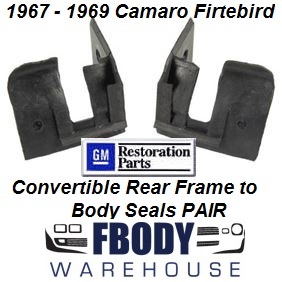 GM Group #: 13.352 GM Part #: RH 7645828, LH 7645829 Officially Licensed GM Restoration Parts.